"Studying abroad in Kosovo was not only a highlight of my time at Miami but one of the best decisions I've made in my life thus far. I have always wanted to work for an international organization that caters to a local community. 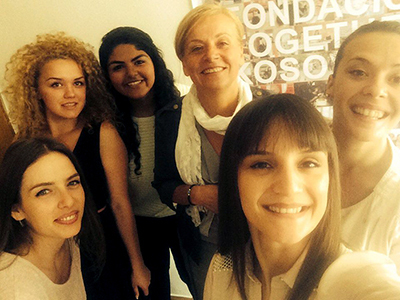 Receiving the International Gilman Scholarship helped to make my trip to Kosovo feasible." "During my tour here as a prospective student I was struck by my tour guide's passion towards Miami. I was in her last group before she graduated, and by the end of the tour she broke into tears. This really struck a cord with me because her relationship with Miami wasn't just about academics but her personal experiences like making new friends, connecting with professors, and studying abroad. At that point I knew that Miami was the right institution for me. "I already knew I wanted to major in Political Science, because politics has been a big part of my upbringing. My mother and grandfather were always discussing politics, and inadvertently I would begin to discuss politics with my friends in grade school. In addition, being a first-generation Afghan-American in the post-9/11 era, it is difficult to not talk about politics! I joke around that I am the unofficial ambassador here for all things related to Islam and the Middle East. Furthermore, my family sought refuge in Kuwait after the Soviet invasion of Afghanistan in the late 1970s and then left Kuwait when Iraq invaded; this family history mobilized me to learn more about the region's politics. "Looking at courses offered through the Department of Political Science, I came across Dr. Adeed Dawisha's Politics of the Middle East course. Dr. Dawisha is not only a distinguished professor at Miami but also an exceptional and accomplished academic within the field of Middle Eastern politics. I have nothing but praise for him and his courses. He taught me to think critically about the different political systems within the area and the ramifications of outside actors like religion, ethnicity, and nationalism on these systems. "After signing up for the Middle East and Islamic Studies minor, I picked up the Arabic minor because I'm always looking for a new language to learn. My mother tongue growing up was Dari (spoken in Afghanistan), I've been taking French since middle school, and recently I've been working on my Turkish. When I heard that Miami offered Arabic courses my freshmen year, I was ecstatic. I knew the Arabic minor would not only complement my major but also be a valuable asset when applying for jobs. I've always wanted to work both domestically and internationally, so having a double minor in Arabic and Middle East and Islamic Studies would help me to do so." "My best experiences at Miami have been the ones that helped me to push myself beyond my limits. I've been fortunate enough to take courses with professors who are passionate about teaching and challenge you to think beyond the introductory concepts. "My two study abroad experiences at Miami were made possible by the university's dedication to these programs. The first time I was granted the International Gilman Scholarship to work with a NGO [non-governmental organization] in Kosovo. The second time I was a teaching associate for the newly developed Oman program in January 2015 and was able to conduct fieldwork. Both of these experiences have been essential to helping me figure out what I want to do after I graduate. "My favorite courses include Dr. Dawisha's Nationalism, Islam & Democracy in Arab Politics, Dr. Matthew Wahlert's U.S. National Security Policy, and Dr. Nathan French's Global Militant Islamisms, all of which I took during the same semester! These courses allowed me to look at a situation from different perspectives. For example, Dr. Dawisha's course touched on how jihadist and Islamist movements threatened governments in the Arab world, Dr. Wahlert's course examined different threats to U.S. national security, and Dr. French's course looked at the birth of extremist movements and how they've changed over time. Dr. French's course led to my current independent study with Dr. Patrick Haney, called 'The Politics of ISIS'. "Studying abroad in Kosovo was not only a highlight of my time at Miami but one of the best decisions I've made in my life thus far. I have always wanted to work for an international organization that caters to a local community. Receiving the International Gilman Scholarship helped to make my trip to Kosovo feasible. "I worked on preparing and writing grants for a small NGO in Kosovo which was focused on the psychosocial wellbeing of youth prior to the 1998 war. I put in a lot of time and effort because my work was pertinent to the NGO and the people we were serving. Receiving the grant determines if the organization will be able to help the youth receive the proper medical attention they need. 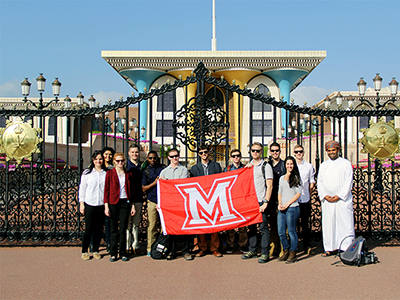 Participants in the 2015 Transitions and Traditions in Oman January Term course pose near the finish of their visit. "This past January, I went on my second study abroad trip, this time to Oman for a newly developed program by Dr. French and Dr. Elizabeth Bergman. They asked me to be a teaching associate on this trip, and I accepted it immediately because I have immense respect for the work my professors have done in their respected fields. In addition, I've always wanted to study abroad in the Arab world. 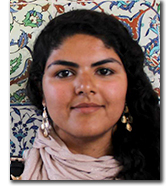 "The Oman program was unique to me because although I grew up with friends and family who have lived in that region, Omani culture felt very unique to other Arab cultures. Most Omanis identify with a minority sect of Islam called Ibadism. "During our visit to the Sultan Qaboos Grand Mosque, I was struck by the plurality and simplicity of the mosque's architecture. The mosque's exterior has a minimalist aesthetic, but once you enter the main prayer room you face an intricately designed mihrab (indicating the direction of prayer), which was crafted from deep cobalt and gold tiles that created various geometric designs. "In the courtyard, each of the hallways was dedicated to a different period of Islamic art. Being able to see that kind of plurality and recognition of different phases of Islam was extremely refreshing as someone who studies Islam and is a Muslim. For me it symbolized that while there are different variations of practicing Islam, there can still be harmony between the different sects." "A liberal arts education helps you to explore fields outside of your major and develop diverse approaches to processing information, learning about a new society or culture. You are given the opportunity to study a new field and use the tools from your expertise and acquire new ones along the way to think critically about a new subject, whether it is chemistry or anthropology. As a freshman I took Dr. Gwendolyn Etter-Lewis's Black Feminist Theory course, which focused on theory work, something I was not familiar with and thought was not relevant to my major. We looked at how being black and female shouldn't be viewed as independent identities but instead be dependent on the other. By the end of the course I grew to love studying theory. This led me to take Dr. Ryan Barilleaux's Political Thinking course the following semester. It focused on political philosophy and theory, and I was pleasantly surprised to find that some of the material in both these courses overlapped each other. "Overall, I think that a liberal arts education is imperative in helping you become a well-rounded individual instead of focusing on one career path. It provides you with background and peripheral knowledge of other majors. You get to learn how different majors analyze material and how their thought process works, and this will make you stand out to future employers." Sara Dastagir poses with some friends in Kosovo. "I always describe Kosovo as a blend of the United States during the 1990s, Europe, and the Ottoman Empire. While working at the NGO there, we all often drank Turkish coffee in the afternoon on the balcony and talked about politics, daily life, and Kosovar culture. Kosovars are strong individuals who have been through a lot. Many Kosovars, when they were my age, saw their friends and family members die in front of their faces. While I was interested in learning more about Kosovo from the Kosovars, they were always curious to hear about my impressions of their country as an American. One afternoon, I asked them, 'When I go back to America, what is the one thing you want me to tell my friends and family about Kosovo?' They told me that they're just like Americans in that they also have dreams and aspirations. "I'll never forget the weekend trip I took to Gjakova with my co-workers. There was a section in the heart of the city that was untouched by the war, and it served as a reminder to future generations of the genocide committed by the Serbs. Later on, I asked my co-workers about their memories of the war. One of them said that she still has nightmares. During the war, whenever she heard gunshots or bombs she would have a panic attack. She said some people got used to the sounds, but it was impossible for her. Eventually, her mom had to give her medication to keep her calm. It made me realize that many memories don't go away, and it is hard to let the ethnic tension go that created those memories." "Don't be afraid to take courses that are appealing to you even if they don't fit with your major—you will still find your niche. Early on I took an introductory journalism course to complete a Miami Plan requirement and because I was considering a journalism major. Although I personally felt that journalistic writing seemed too standardized, the course solidified my love for political science. "As far as study abroad goes, just do it if you have the chance. Take that initial step. Miami has tons of amazing programs, but if you can't find one you like, go to the Study Abroad Office. A friend of mine was able to find a program provided by another institution and receive Miami credit. Once you have a program in mind, you can find tons of scholarships to help fund your trip. Receiving the Gilman Scholarship helped me cover the costs for my experience in Kosovo, and it opened many new doors for me!"